That said, this isn’t the United States. The Daily Cure is not a federal government with States running about doing as they please. 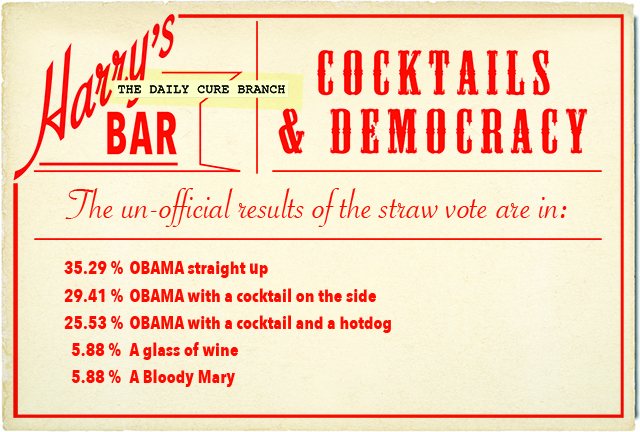 There’s no Daily Cure Electoral College. And I have no lawyers, standing by. If only real life were so simple. This entry was posted in FRANCE, WHAT TO DO and tagged Harry's New York Bar Paris, politics, Presidential election, straw poll, straw vote, winner. Bookmark the permalink. 1 Response to The voting results are in!